공주시 무령왕릉에서 왕의 관식과 함께 출토된 왕비의 금제 관(冠)장식으로, 모양과 크기가 같은 한 쌍으로 되어 있다. 높이 22.6㎝, 너비는 13.4㎝로 1971년 무령왕릉이 발견·조사되었을 때, 왕비의 널(관) 안쪽 머리 부근에서 포개진 상태로 발견되었다. 금판에 무늬를 뚫어서 장식하고 밑에 줄기를 달았다. 투조(透彫)로 표현된 문양은 좌우대칭을 이루도록 정돈되면서 정연한 느낌을 준다. 문양은 중심부의 연꽃받침 위에 놓인 병을 중심으로 그 주위에 덩굴무늬가 있고 병 위에는 활짝 핀 꽃 한송이가 있으며, 중간부터 위쪽의 가장자리에는 불꽃무늬가 솟아 있는 모습으로 표현하였다. 무령왕릉 안에서 같이 발견된 왕의 관(冠) 장식보다 규모가 조금 작고 구슬 등의 장식이 달려있지 않아 간결한 인상을 준다. 무령왕릉은 백제 25대 무령왕(재위 501∼522)과 왕비의 무덤으로, 벽돌을 이용해 만든 벽돌무덤(전축분)이며, 많은 유물이 발견되었다. 이들은 6세기 전반 백제문화의 수준과 묘제, 사장 등의 일면을 알려주는 자료로 평가되고 있으며, 이 가운데 지석(誌石)은 삼국시대 고분 중 최초로 무덤에 묻힌 주인과 만든 시기를 밝혀주는 자료가 되고있다. 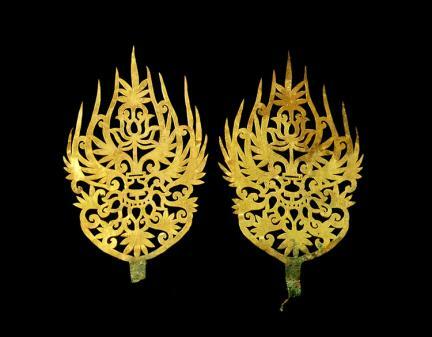 This is a pair of golden ornaments for a crown identical in size and shape. They were excavated from Royal Tomb of King Muryeong in Gongju. They are 22.6cm tall and 13.4cm wide. When the royal tomb was discovered and excavated in 1971, these ornaments were found to be placed on top of each other around the head of the queen's coffin. 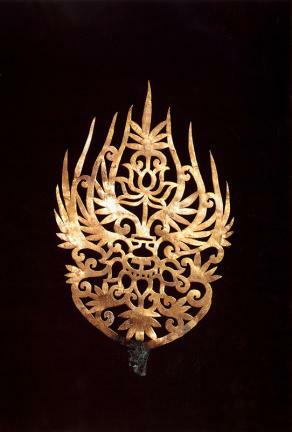 A gold plate is cut into form this symmetrical shape by using sharp tools. Honeysuckle-shaped patterns are placed at the bottle on top of a lotus-blossom-shaped support in the middle part. At the top of the bottle is a flower in full bloom. There is a flame pattern on the edges from the middle to the upper part of each ornament. They are a little smaller than those of the King's crown, which were discovered at the same site. Both are simple in design since there are no special attachments such as beads. This tomb was built for both King Muryeong, the 25th king of the Baekje Dynasty who reigned from 501 to 522, and his queen. It’s one of the most well-known royal tombs because it’s one of the rare tombs that were built with bricks, and also a great amount of burial goods - 2906 pieces of remains ranging over 108 categories - were excavated from it. They have been regarded as important sources for studying Baekje, particularly the culture and customs of the ancient kingdom. Among them, jiseok, a slab of stone inscribed with the deceased's date of birth and death together with his achievements, reveals the exact owner of the tomb and the exact date of construction. The Royal Tomb of King Muryeong is the first among all the tombs from the Three Kingdoms Period that records the name of the buried king and the exact date of construction.